This elegant and sturdy little Huon pine craft known as TRIM, spent the first half-century of her life criss-crossing Hobart’s Derwent River, also Melbourne’s Hobsons Bay, but rarely getting wet. The 15′ double-ender was built in 1913 to serve a lifeboat sitting under canvas on the ferry ROSNY. She underwent a career change in 1968 when a troop of Sea Scouts launched her as a sail-training dinghy. She has now been restored by enthusiasts keen to preserve Australia’s maritime heritage. 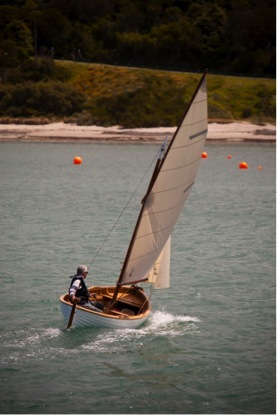 This renaissance of traditional boats has embraced all types of craft, from classic yachts to vintage powerboats. Some of these are restorations while others are replicas of time-tested designs. All have an aesthetic heritage that stirs the imagination. The restoration of TRIM has preserved a rare link to the age of working sail. Small workboats usually did not enjoy longevity, but this centenarian Tasmanian led a very fortunate life. She not only survived, but remained intact for one hundred years. Having no recorded name, the new owners christened her TRIM after the great Pacific navigator Mathew Flinders’ seafaring cat—also because only four letters would fit onto the roundels built into the bow. TRIM was built in Hobart in 1913, just prior to the advent of small marine engines that soon eliminated the need for sail. Small boats swarmed Tasmanian inshore waters and harbours from about 1810, their design evolving to suit the manner of their use and nature of the waterways. These craft blended form and function as utility boats for transporting people and goods point to point and between ships and shore. The workboat operators were called ‘watermen’ and in Hobart in 1850 there were more than 200 licensed watermen. Watermen operated as the taxi drivers and couriers of their day, which continued until the last licensed waterman retired in the 1940s. Their craft were usually 14 to 22′ in length, depending on the carrying capacity needed, but some watermen also had large excursion boats, also known as “picnic” boats. 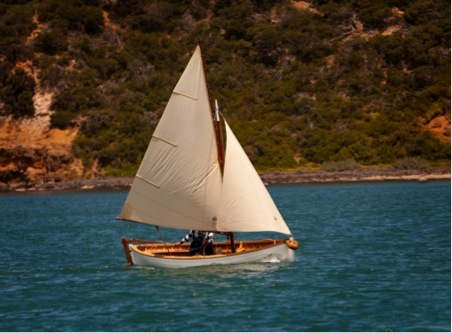 The last known nineteenth-century Tasmanian waterman's boat is believed to be the beautifully restored eight-oared 28′ ADMIRAL built in 1865. TRIM is a significant example of its era. Her construction is sturdy due to the clinker-construction with gunwales nearly straight from bow to stern The beam-to-length ratio of 2.7 gives seaworthiness, good carrying power, and fair speed. The hull has a flat shallow-draft for pulling up on shore and the barn-door rudder can be raised in–line with the keel. There are three bench thwarts that accommodate four oarsmen: two off-set. With a coxswain on the tiller TRIM is efficient under oar and the double-ender design makes her more manoeuvrable to row than many other boats. Although small for extended voyages, she has a central daggerboard, and the sliding gunter rig with stem-mounted foresail sails her efficiently in a favourable wind. The research moment that corroborated TRIM’s provenance came when I was searching the archives of the Maritime Museum of Tasmania. The file on the ferry ROSNY contains early photographs verifying the lifeboat’s proportions, lines, strakes, and the distinctive roundels on the bow. 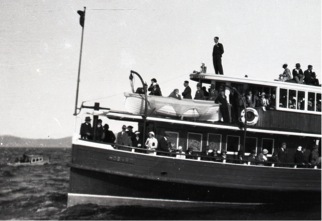 It was the Rosny Estates & Ferry Co Ltd that commissioned the 110ft steam vessel S.S.ROSNY for Hobart’s trans-Derwent ferry service. ROSNY was designed by Walter Reeks, built by Frederick and Harry Moore in Kennedy’s Shipyard, Battery Point, Hobart and was launched on 26 July 1913. She carried two 15ft double-ender lifeboats stowed on deck: one being TRIM. ROSNY operated as a ferry on the Derwent, later on Hobsons Bay, Melbourne, then back in Hobart on the Bellerive run until 1963 when she was sold to Tamar Cruises Pty Ltd, Launceston. That company went into liquidation in 1964 and ROSNY was laid up until being sold again in 1966 for use as a floating restaurant. When a permit for that was denied, ROSNY was towed to Devils’ Elbow on the Tamar and in 1968 sank on her mooring. An auction of ROSNY’s fittings and equipment was held and the 18th Launceston Sea Scouts (now 1st Tamar Sea Scout Group) bought one of the lifeboats as a training cutter. They happily used her for sail training and seamanship competitions. In 1987 Mr. Rod Clarke of Launceston bought her and eleven years later sold her for a second stint with the Scouts - this time 1st Trevallyn Sea Scout Group, Launceston. Mr. Nigel Buest, Sunrise Picture Co, bought the boat in 2005 for use in the documentary ‘Darwin Harbour’ about the remarkable 1865 voyage along Australia’s west coast of the lifeboat ‘Forlorn Hope’. The current owners then purchased it from Mr. Buest in 2012. Such a classic craft warranted salvation, so a pilgrimage was made to the cathedral of traditional boats, the Wooden Boat Shop on Port Phillip Bay. TRIM was heat-gunned, scraped down to bare timber and lovingly sanded, particularly her bottom that had been daubed with tar. Despite their age the Huon pine strakes and ribs were found to be sound, including some previous repairs that were workmanlike and also in Huon pine. Because Huon pine is 3% oil, it resists rot and marine borers and in Tasmania was traditionally the timber of choice for small boat building, where strength can be traded for lightness. The join-fixing of a couple of previously repaired strakes were re-nailed deeper to enable heavy sanding for better fairing. All the filler and caulking cotton in the hull was stripped out. 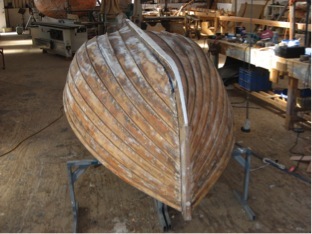 Blue Gum had been used for building the keel and stems and a section of rot was found in the shoulder of the bow stem. New timber was inserted to restore the stem to its original sound condition. Although no strakes needed replacing, marine epoxy (West System) was used to fill various dents, cracks, nail holes and screw heads. Rebates around the stems and along the keel were caulked with new cotton and a polyurethane bonding sealant (3M Marine Adhesive Sealant 5200). The same flexible bonding sealant was also used along all the lapstrakes, from gunwale to keel, because this helps avoid straining the frames when the planking ‘takes up’ in the water. Recoating the hull started with an epoxy penetrating solution to waterproof and seal the timber, then two coats of a primer-undercoat were applied. Two finishing coats of two-pack polyurethane were applied for durability and weather resistance. The traditional lifeboat colours of ‘White’ hull and ‘Cumberland Stone’ gunwales, interior, thwarts and floorboards are accurate to original aesthetics. The late nineteenth-century was arguably the period of greatest progress in small workboat rigs. Around 1800 the easy hoisted and lowered Sprit rig was most common and by mid-century the quadrilateral Lug mainsail was favoured. Improved windward performance then came with the sliding Gunter rig, the yard being peaked almost in line with the masthead. The improvement came from the higher aspect ratio of its triangular mainsail, although this wasn’t truly understood until years later through the design of aircraft wings. By the early 1900s small utility boats, yacht tenders, navy whalers and small lifeboats, such as TRIM, were using the sliding Gunter system. Still a short mast rig, the sliding Gunter retained the convenience of stowing the spars and sails in one bundle within the length of the boat. Rather than trying to reef a small boat in heavy winds, watermen used a shoulder-of-mutton storm trysail that had neither yard nor boom. A quick swap was easier and safer than struggling with the reefing process. And TRIM’s 100th birthday present? A suit of Dacron sails in traditional cotton cream colour crafted in narrow 18 inch panels, in keeping with how she would have looked had she ever had to carry a cargo of bedraggled ferry-wrecked passengers ashore.